It's a beast, has tons of power and will do what you need it to do. I don't have any problems with my truck. I love my truck. It will pull anything I need it to pull from our flatbed trailer loaded with hay or lumber to our horse trailer. It also pulls our camper and boat. As long as regular routine maintenance is done these trucks are awesome and powerful. I like the leather heated seats and the nav system that my truck is equipped with. 2006 RAM 3500 quad cab slt. My RAM 3500 so far has not had any problems other then the ball joints go bad fairly quick, the power is very good, and it is a very dependable truck, all and all I would buy another one, the ride of the 3500 is a little rough but you have to expect that from something that can haul what these things can. 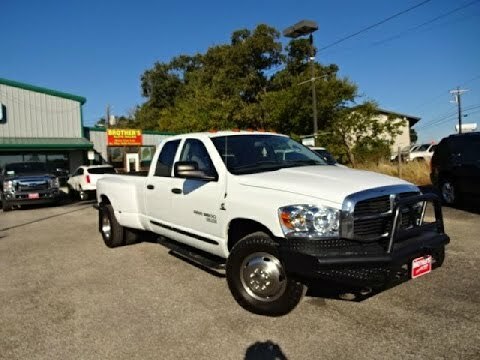 The Dodge Ram truck is a great choice for someone wanting a good overall vehicle. My Dodge pickup is a Ram 3500 super cab 4x4 with a 6 speed transmission and diesel engine. The truck has plenty of power for anything I have had to carry or tow. The fuel mileage is quite good. The ride is very comfortable and easy to drive on long trips without driver fatigue.